The bods at Nike have created a groundbreaking new metric called NikeFuel that measures how active you are regardless of whether you’re a runner, a basketball player, a skateboarder or even a drummer. The more involved you are, the more NikeFuel you gain. And using the Nike+ FuelBand (think of it as an evolved version of the Nike+ chip and footwear) that syncs to your iPhone, it allows you to set your own goals whilst digitally tapping into a global community. By combining the emotional motivation of personal competition with this real data, NikeFuel and the FuelBand makes - much like the Air Max - the invisible visible, inspiring you to make a conscious change in everyday life. The man whose obsession it is to inspire and innovate is Nike’s visionary CEO, Mark Parker. Known as one of the most creative CEOs in the world, Parker comes from a celebrated footwear design background, rather than a financial one. Joining Nike in 1979, it’s his creative force that makes him such an engaging cultural powerhouse. It was Parker who kickstarted Nike’s artist collaborations way back in the day, and a large part of last year’s 'Art In The Streets' exhibition at the MOCA was borrowed from his personal collection - from Basquiat to Barry McGee. In a rare and exclusive interview, Dazed spoke with Parker at the NikeFuel launch in New York. 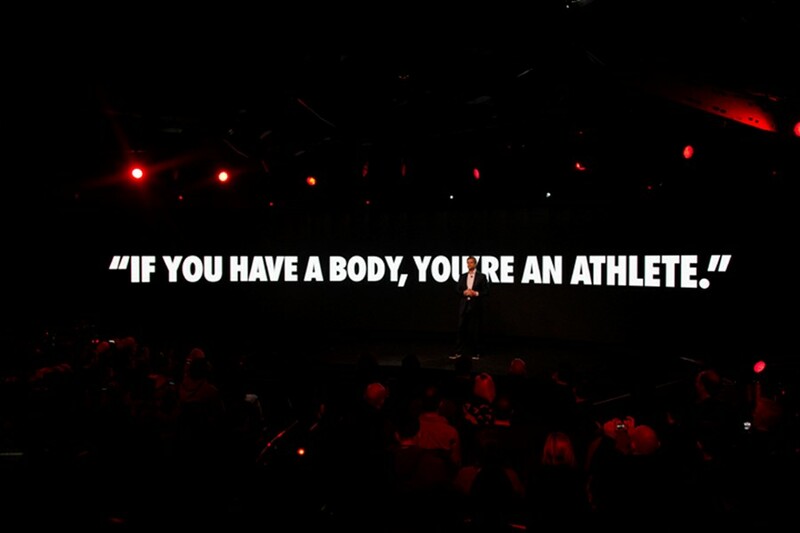 Dazed Digital: What seems so powerful with NikeFuel is how you are changing people’s everyday awareness. Mark Parker: It’s very personal. I’ve been using it this week and I have to admit I’m taken back at just how much more aware I am of everything that I’m doing. The awareness is very motivating because it’s a very dramatic change. Always in your consciousness. It helps you want to do more. DD: It’s like a new social movement. Mark Parker: I’m really excited to see how this is going to take off. Not just for the elite athletes but more so for everyone else. And what people do with it. We won’t figure out everything that we can do with NikeFuel - the user will. DD: What continues to inspire you? Mark Parker: People, athletes, nature, nano technology, material science, 3D printing, there’s really exciting possibilities with that. There’s so much innovation happening in different parts of the world that we can take and adopt it in what we do. What we’re all about is solving problems. DD: Bringing certain creative and cultural references to Nike really sets you apart. Mark Parker: I love working with creative people in all fields, from engineers to artists. You get different insights and perspectives and what we do is mashing up ideas. Taking people from two completely different worlds, putting them together and seeing what comes out. I love that. The unexpected. The key is to be open and receptive. There’s so much opportunity to make stuff that is over or under designed and that just isn’t useful, so it’s really important that the things that we do create, are things that are really relevant. DD: How do you feel about the legacy you have created over the 30 plus years? Mark Parker: I’m proud of what we’ve done over the years but what excites me more is what’s ahead. I’ve never seen more opportunity for real innovation than now. And I really believe that. I’ve been designing at Nike since 1979 and people would ask me back then, ‘What more can you do that already hasn’t been done?’ I look back on that and have to laugh. I like to focus on potential and I think that’s what a real innovator does, a real leader in any field. How much better can we be? There is no finish line.